First Dragoons.- Cols., Alfred Gibbs, Thomas J. Thorp; Lieut. Cols., Thomas J. Thorp, Rufus Scott; Majs., Rufus Scott, Jacob W. Knapp, Howard M. Smith. 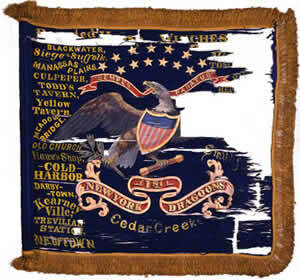 This regiment was organized in the summer of 1862 at Portage, as the 130th infantry and served as such at Suffolk, Va., and in Keyes' corps on the Peninsula. The companies of which it was composed were recruited in the counties of Alleghany, Livingston and Wyoming. It was mustered into the U.S. service at Portage, Sept.2, 1862, for 3 years. On July 28, 1863, it was transferred to the mounted service, and designated the 19th cavalry on Aug. 11, but this designation was changed on Sept.10, to 1st regiment of dragoons. The regiment- ten companies- left the state on Sept. 6, 1862, and served as above noted. During its entire mounted service it was in the 1st cavalry division, Army of the Potomac. It was drilled in its new duties by Col. Gibbs, who belonged to the U.S. cavalry service, and as a regiment of dragoons made its first fight near Manassas Junction in Oct., 1863, sustaining a loss of 10 killed, wounded and missing. The regiment moved on Grant's campaign of 1864 with about 400 carbines and fought desperately in the Wilderness (at Todd's tavern), dismounted, sustaining a loss of 20 killed, 36 wounded and 35 missing, the heaviest loss of any cavalry regiment in any one action during the war. It took part with loss in Gen. Sheridan's raid to the James River in May; at Cold Harbor the tired troopers were aroused from their sleep on the ground and ordered into the breastworks, which they gallantly defended throughout night, inspired by the music of their bard. The losses at Cold Harbor aggregated 35 killed, wounded and missing. Sadly reduced in numbers, the gallant dragoons moved with Sheridan on the raid to Trevilian Station, where they were warmly engaged, their casualties in that action amounting to 16 killed, 61 wounded, and 8 missing. The regiment fought with Sheridan in the Shenandoah Valley and shared glories of the final Appomattox campaign. It gained a high reputation among brigade and division generals for discipline and efficiency. Under command of Col. Thorp, it was mustered out and discharged on June 30, 1865, at Cloud's Mills, Va., having participated in about 65 battles and skirmishes. It lost 4 officers and 127 men killed and mortally wounded; 1 officer and 142 men by disease, accident, in prison, etc. ; a total of 274. Its loss in killed and mortally wounded was exceeded by only five cavalry regiments in the service. Corp. Chester B. Bowen; Andrew J. Lorish and Lieut. William M. Winegar were awarded medals of honor for gallantry in action. From Regimental History of the First New York Dragoons, 1900. September- 13, arrived at Suffolk, Va.
January- 30, battle of Deserted House. April- 11, siege of Suffolk began. May- 3, siege of Suffolk closed. June- 12, skirmish at South Quay; 13, skirmish at Franklin; 17, skirmish on the Blackwater; 19, left Suffolk to join Keyes' Peninsula expedition; 20, arrived at Yorktown; 22, Williamsburg; 27, White House. July - 1, at Baltimore Cross Roads; 3, retired towards White House, skirmish at Baltimore Cross Roads; 9, Williamsburg; 10, Yorktown; 11, embarked for Washington; 12, arrived at Washington; 13, Frederick, Md. ; 17, Berlin, assigned to Army Headquarters; 19, crossed the Potomac; 22, Upperville; 23, Manassas Gap, 24, Salem; 24, Warrenton; 28, regiment transferred to cavalry service, First New York Dragoons. August- 1, marched to Warrenton; 3, Union Mills. August 6 to Oct. 12 at Manassas drilling in cavalry tactics. October- 13, rejoined the Army of the Potomac, engagement at Manassas Plains. November- 20, engagement at Culpepper Courthouse. December- 26, moved from Culpepper to Mitchell's Station. February- 6,7, reconnaissance to Robertson's River; 28, detail from regiment to join Custer's Charlottsville Raid. March- 29, review of 1st division of cavalry by General Grant. April- 23, moved to Culpepper. May- 4, broke camp for the Wilderness campaign; 5, crossed the Rapidan at Ely's Ford; 7, battle of Todd's Tavern; 8, engagement on Spottsylvania road, Sheridan's raid to Richmond begun; 9, Beaver Dam Station; 10, crossed South Anna River, skirmish at Anderson's Bridge; 11, battle of Yellow Tavern; 12, Richmond, battle of Meadow Bridge, Mechanicsville, Gaines Mills; 13, crossed Chickahominy at Bottom's Bridge; 14, Malvern Hill, Haxall's Landing; 17, night march crossing Chickahominy at Jones's Bridge; 18, Baltimore Cross Roads; 21, White House; 23, King William's Courthouse; 24, Polecat Station, rejoined the Army of the Potomac; 26, Chesterville Station; 27, Hanover Town, 28, battle of Hawe's Shop; 30, engagement at Old Church; 31, first engagement at Cold Harbor. June- 1, second engagement at Cold Harbor; 2, Botom's Bridge; 3, reconnaissance to Jone's Bridge; 4, Old Church; 7, Trevilian raid begun, marched to Dunkirk; 8, Polecat Station; 10, within two miles of Trevilian Station; 11, first engagement at Trevilian; 12, second engagement at Trevilian; 13, retired by way of Carpenter's Ford; 14, six miles from Spottsylvania Courthouse, Schouler's Plantation; 17, Bowling green, Newton, Dunkirk; 18, King and Queen's Courthouse; 19, to West Point and back to Dunkirk; 20, to West Point again; 21, crossed at Pamunky; 24, crossed the Chickahominy at Jones's Bridge; 24, rejoined the Army of the Potomac at Harrison's Landing; 29, crossed the James to Prince George's Courthouse; 30, to Reams Station. July - 2, went in to camp at City Point; 26, reconnaissance across the James; 27, on the Newmarket road; 28, skirmish at Darbytown; 29, engagement at Darbytown; 30, returned to Petersburg, Reams Station; return to City Point. August- 1, embarked for Washington and the Shenandoah Valley; 2, landed at Giesboro Point; 6, Rockville, Clarksburg, Hyattstown; 7, Jefferson, Knoxville, Harper's Ferry, Hallstown reconnaissance to Shepherdstown; 10, Berryville, Engagement at White Post; 11, engagement at Newtown; 12, Middletown; 13, reconnaissance to Strasburg; 16, Nineveh; 17, Berryville; 20, reconnaissance to Kabletown; 21, retired to Charlestown; 22, to Shepherdstown; 25, reconnaissance to Leetown, engagement at Shepherdstown, retired across the Potomac to Sharpsburg; 26, Harper's Ferry, Bolivar Heights; 27, reconnaissance to the Charlestown and Shepherdstown road; 28, first engagement at Smithfield; 29, second engagement at Smithfield; 30, Berryville. September- 2, to Rippon returning to Berryville; 4, Snicker's Ferry; 5, Summit Point; 8, Smithfield; 18, Summit Point; 19, battle of Winchester; 20, Strasburg; 21, Middletown; 22, Woodstock; 23, engagement at New Market; 25, Harrisonburg; 26, engagement at Port Republic; 27, engagement at Cross Keys; 29, Port Republic, Mt. Crawford; 30, Cross Keys. October- 2, engagement at Mt. Crawford; 5, Cross Keys; 6, Harrisonburg, Timberville; 7, Edenburg; 8, engagement at Tom's Brook; 9, Woodstock Races, driving the enemy twenty miles through Mt. Jackson; 10, Tom's Brook; 11, Bowman's Ford, 13, near Middletown; 14, engagement at Strasburg; 15, Front Royal; 16, Middletown; 19, battle of Cedar Creek; 10, Woodstock; 21, in camp at Middletown. November- 7, reconnaissance at Front Royal; 10, retired to near Winchester; 12, engagement near Newtown; 13, reconnaissance to Cedar Creek; 21, reconnaissance to Front Royal; 22, regiment on picket during brigade reconnaissance to Milford; 23, in camp near Winchester; 28, Loudon raid begun, Asby's Gap, Paris, Upperville; 29, Bloomfield, Snickersville; 30, Waterford, Lovettsville. December- 1, Wheatland, Snickersville; 2, Snicker's Gap, Beryville; 3, return to camp near Kernstown; 19, Gordonsville raid begun, Front Royal, Chester Gap; 20, Flint Hill, Sperryville; 21, Madison Courthouse; 22, crossed the Rapidan on Gordonsville road, engagement at Liberty Mills; 23, engagement at Gordonsville, retired across Rapidan and Robertson Rivers; 24, Alderate Mills; 25, Warrenton; 26, White Plains; 27, Millwood; 28, Kernstown; 29, marched to Smithfield; 30, Hallstown. January- in camp near Lovettsville. February- 27, James River raid begun, marched up the valley to Woodstock; 28, Mt. Jackson, New Market, Lacy's Mills. March- 1, Harrisonburg, Mt.. Crawford; 2, Staunton, Fisherville; 3, Waynesboro, Rockfish Gap; 4, Charlottesville; 3, Scottsville, Howardsville, New Market; 7, reconnaissance to DuguidsviIle Bridge; 8, night march to Columbia Courthouse; 11, reconnaissance to Goochland; 12, Tolersville Station, Fredericks Hall; 14, Taylorsville; 15, Hanover Junction, Chesterville Station; 16, Twenty miles towards White House; 17, Ayletts, King William Courthouse; 18, White House; 25, Baltimore Cross Road, Charles City Courthouse., Harrison's Landing,; 26, Malvern Hill, cross river at Deep Bottom joining Army of Potomac; 27, front of Petersburg; 29, Appomattox campaign begun, Reams Station, Dinwiddie Courthouse; 30, move to Five Forks and retired; 31, engagement at Dinwiddie Courthouse. April- 1, battle of Five Forks; 2, Deep Creek, engagement at Sutherland Station; moved towards Amelia Courthouse; 4, skirmish near Amelia Courthouse; 5, Jetersville; 6, battle of Sailor's Creek; 7, Prince Edward's Courthouse; 8, engagement at Appomattox Station; 9, Appomattox Courthouse, Lee's surrender; 10, returned to Prospect Station; 11, Prince Edward's Courthouse; 12, Burkesville; 13, Nottoway Courthouse; 18, Petersburg; 24, Dan River expedition begun, 25, Meherrin River; 27, Clarksville; 28, crossed Stanton River and Dan river. May- 3, returned to Petersburg; 10, Richmond;, 11, passed Yellow Tavern; 13, crossed Rapidan at Raccoon Ford; 14 crossed Rapahannock; 15, Fairfax Courthouse; 16, Alexandria; 21, Clouds Mills; 23- 24, grand review at Washington. June- 30 Mustered out at Cloud's Mills. The above was provided by William C. Morey, Capt., Co. D.